Massachusetts has a variable climate, as indicated by the USDA Plant Hardiness Zones 4 to 7 included within its borders. The type of hydrangea you can grow in the state depends on whether your winter temperatures reach -25 degrees Fahrenheit or rarely dip below zero. The panicle hydrangea (Hydrangea paniculata) and the smooth hydrangea (Hydrangea arborescens) grow everywhere in the state. The oakleaf hydrangea (Hydrangea quercifolia), a Zone 5 plant, grows in most locations. The bigleaf hydrangeas (Hydrangea macrophylla) grow only in Zones 6 and 7, which includes the coast, Cape Cod and the Islands. The lace cap and mophead hydrangeas belong to this group. Choose from the varieties of hydrangea that will grow in your USDA Plant Hardiness Zone. (See the first link in Resources for a detailed map, and find your location.) Check each variety's size and height at maturity to determine the garden space you need. For example, some varieties of the panicle hydrangea grow in a tree form to 20 feet tall. Choose a site in the sun or in partial shade. Avoid planting your hydrangea in a location that receives the hot afternoon sun. Choose an area where the soil is well-drained. Dig approximately 1 foot deep with the shovel to loosen the soil in the area where you are planting the hydrangea. Turn over the soil with the spade fork. Add the compost and mix it in well with the existing soil. Add the sand if the soil isn't well-drained. Dig a hole in the amended soil 10 inches deeper than the bottom of the pot and twice its width. Add the planting mix, and mix with the existing soil. Water the soil in the hole. Take your hydrangea out of the pot. Loosen the roots if they've grown too tight in the pot. Set the plant in the hole. Backfill with the soil, adjusting and centering the hydrangea in the hole as you go. Tamp the soil down gently around the plant. The soil should be at the level it was when the plant was in the pot. Water thoroughly. Water every day for the first week to help establish the hydrangea in its new location. Water regularly throughout the season. Water your hydrangea 1 inch a week, according to Roberta Clark of the University of Massachusetts Extension. In the heat of the summer, you may need to water 2 inches each week. Spread the mulch a few inches deep around the hydrangea but don't cover the area where the plant comes out of the ground. The mulch will help to hold in the water. Fertilize your established hydrangea with a balanced fertilizer such as 10-10-10 in the spring and after flowering. Roberta Clark recommends using 4 oz. for each application. Water as directed in Section 1, Step 7. Prune if necessary at a time that will not interrupt your hydrangea's bud-setting period. This differs with the type of hydrangea. Those that bloom on new wood, such as the panicle and smooth hydrangeas, may be pruned in the early spring. The bigleaf hydrangeas, which include the lace cap and mop head types, may prune just after flowering. Test the soil for its pH. A low pH of 5.2 to 5.5 indicates the soil is acidic. An acid soil is needed to release the aluminum in the soil to make the hydrangea blue. 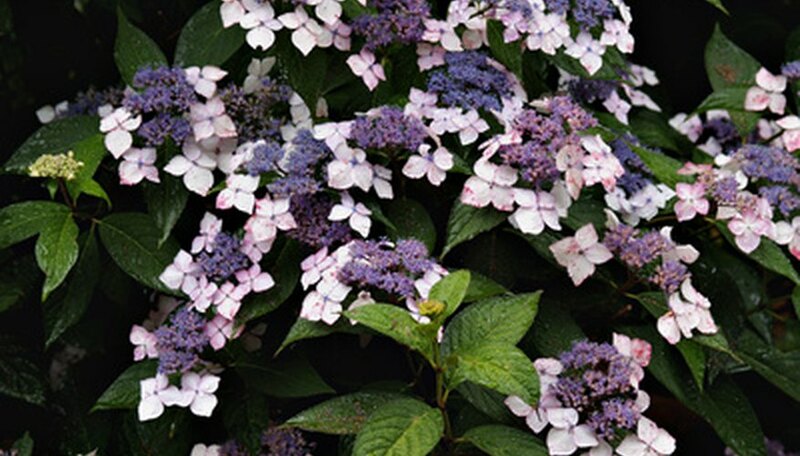 A higher pH of 6.0 indicates an alkaline soil which causes the hydrangea to be pink. The higher pH prevents the hydrangea from utilizing any aluminum in the soil. Add aluminum sulfate mixed in water, as directed on the label, to 2- or 3-year-old plants. 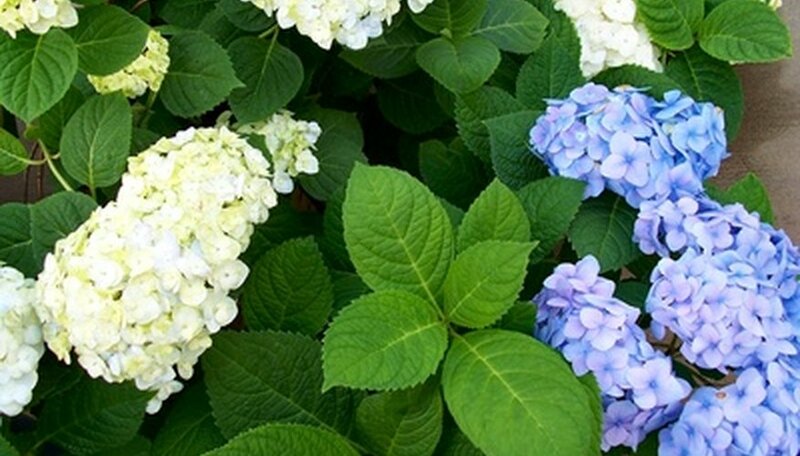 Aluminum sulfate adds more aluminum to the soil as well as lowering the pH, making the hydrangea more blue. Add la handful of lime to the soil to turn the hydrangea pink. According to the website Hydrangeas Hydrangeas, these applications may be done several times each season. Construct winter protection for your bigleaf hydrangeas if they are planted in an exposed site or you are in the coldest parts of Zone 6. Put the stakes around the plant and wrap with the burlap. Do not take the burlap off until all frost danger is past. Hydrangeas don't usually require pruning except to shape the plants or to remove dead stems. Hydrangeas other than the bigleaf varieties don't need winter protection. Many areas such as the Cape and the Islands have naturally acidic soils and hydrangeas are blue on their own. New types of bigleaf hydrangeas bloom on the old wood as well as the new. They flower for a long period, and will still bloom if pruned in the spring. Wait until your bigleaf hydrangea has leafed out before attempting to remove the dead stems. 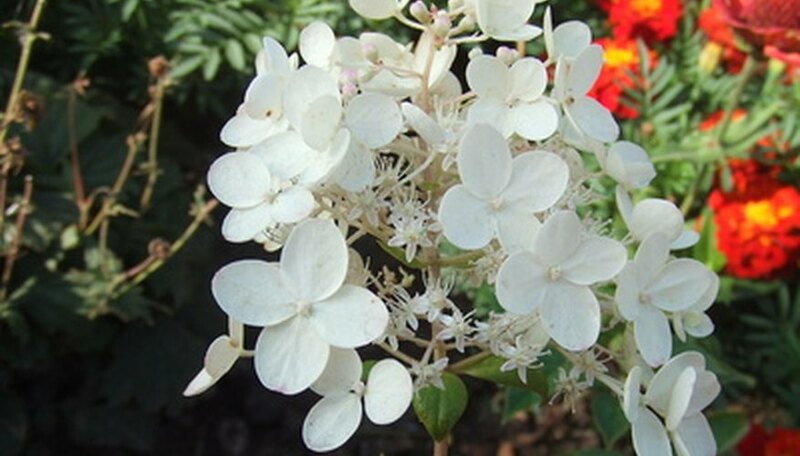 Do not apply too much aluminum sulfate to the soil as it will injure a big-leaf hydrangea. Too much lime can cause an iron deficiency.